There are four levels of home care packages to help meet the different levels of care needs. During your aged care assessment, your assessor will discuss your current care needs and determine the best level to meet them. 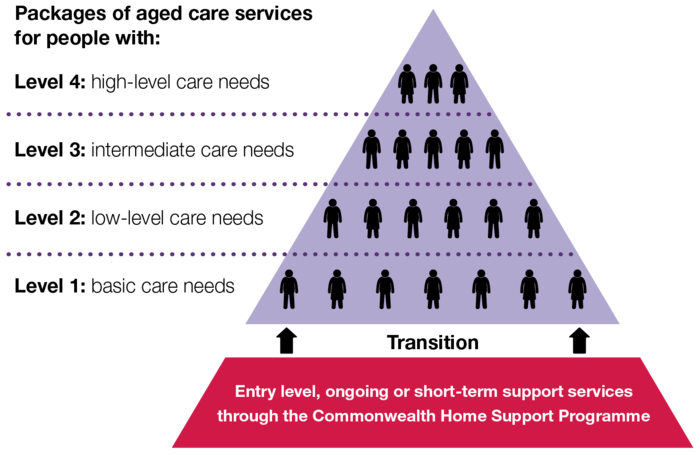 It is expected that more people will be assessed as eligible for a lower level package, with a smaller number being assessed as needing higher level packages. what the Australian Government pays (the subsidy). The Australian Government pays a different subsidy amount for each level of home care package. This amount is paid to the home care provider you choose. Find out more about home care package costs and what you need to pay. During the assessment the ACAT will determine if you are eligible for a home care package and which package level best meets your care needs. If approved as eligible and needing care, you will be approved for one level of home care package. You will be prioritised for care based on your assessed need. Find out more about an ACAT assessment. For people who have been assessed as eligible for a home care package, more detailed information is available in the Your guide to home care package services booklet, also translated into 18 languages. You should receive a copy of the booklet from your assessor or you can download it. A summary brochure Your pathway to accessing a home care package is also available to explain the steps following your assessment, also translated into 18 languages. If you are assessed and approved to receive a home care package, you will need to follow the pathway to access services. Services to help you live independently at home – Home Care Package. Last reviewed: 4 October, 2018.